I was recently watching Ina Garten making her version of this dish, and I immediately wanted to try it. I know, I know, I say that all the time. But it's true! And just as I was assessing how many of the ingredients I would need to buy, I received a text from my friend, Jaclyn, that said 'Have you ever made Coq au Vin?' She was doing the same thing! Great minds think alike, huh????? Love it. 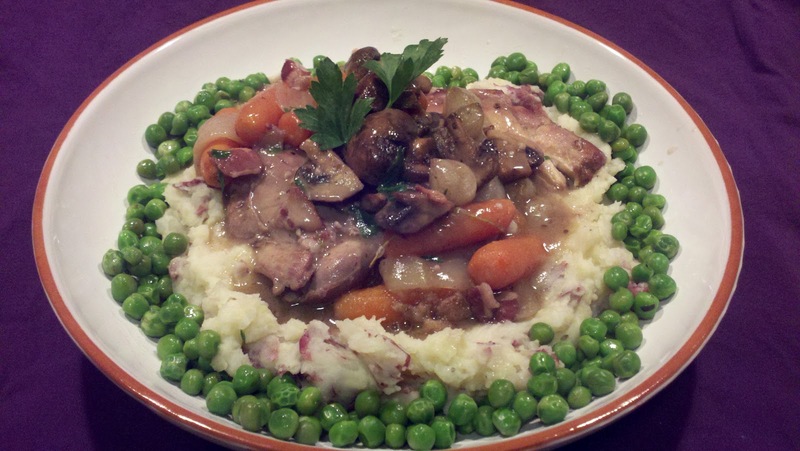 This classic French dish is chicken braised in wine, and I like to think of it as sort of like the chicken version of Boeuf Bourguignon. You start by browning some meat in a little bacon fat, add some aromatics, rich stock, fresh herbs, and lots of wine, then you cook it for a long time in a heavy Dutch oven. How could this possibly be anything but good? I believe "magical" is the word my friend, Marie, used to describe it. I must say, I have to agree! The chicken becomes SO tender and the wine makes the sauce SO rich and flavorful. It's warm and hearty but it's also sophisticated and elegant. And I know it may seem a little daunting, but it's really very simple!!! You seriously need to try it!!!! In a large heavy pot, or Dutch oven, brown the bacon over medium heat until crispy. Remove from pot and set aside. Using a paper towel, dry each piece of chicken. Season the chicken with salt and pepper. Brown the chicken, a couple pieces at a time, being careful not to crowd the pot. Remove the chicken and set aside. (the chicken will not be cooked all the way through. It will finish cooking in the oven!) Add chopped onions to the bacon fat. Saute until they begin to soften. Add garlic and saute for a minute or two longer. Add brandy and scrape up any browned bits from the bottom of the pot. Place chicken back into the pot. Add broth, wine, carrots, and thyme. Cover. Place in oven for about an hour and a half. In the meantime, saute the mushrooms and pearl onions in a little butter with a splash of chicken broth, salt and pepper. Let them saute until all of the liquid evaporates. Remove the pot from the oven. Remove the sprigs of thyme from the pot. Add the chopped parsley. In a small bowl, make a paste by stirring together the butter and flour, then stir it into the stew to thicken. Serve over smashed potatoes, with mushrooms and onions on top, and sauteed frozen peas on the side. -If you don't want to buy a whole bottle of brandy, just for 1/3 cup, you can either buy one of those little tiny bottles, or simply leave it out! -I used just chicken thighs because they're always moist and tender, but you can use a whole chicken cut up into pieces, if you like. I think the next time I make this, I might try it with boneless thighs instead of bone in. They are GREAT in Chicken and Dumplings. I'll let you know how it turns out! -I like to use frozen pearl onions, (just because I didn't feel like blanching and peeling fresh ones), but the store was all out of the bags of frozen ones. The solution? Since I was planning to serve peas on the side anyway, I bought a bag of frozen peas with pearl onions and just separated them. Easy! -To make it easier to retrieve the thyme sprigs from the pot after the cooking is over, tie them together with a piece of thin cotton twine. -The recipe says to add one pound of carrots, but I LOVE carrots so I added TWO pounds! Like my Mom always used to say, "If you like a lot, add a lot!"